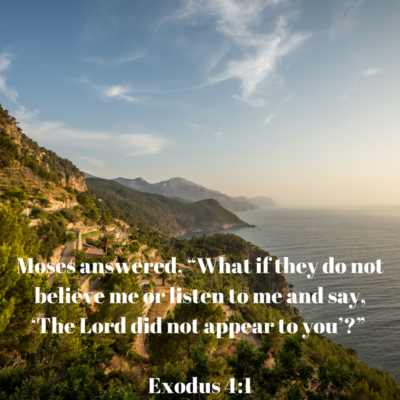 I love the truth in the scripture here in Moses’ life. Mostly because it is so easy for me to relate to. I can hear myself saying these same words to God when he calls me. “Adam, I want you to go tell the church…” and I don’t know if you realize this, but as a pastor sometimes the things God is wanting us to say aren’t easy. As a shepherd, you never want to say things that hurt the sheep, but you know that sometimes you. So sometimes, God says this and I say, “Well, what if they don’t listen? What if they don’t believe it was you talking to me and it was just something from my own heart?” I’ve yet to have God prove himself to me by allowing me to throw a stick on the ground that turns into a snake. Does that make him any less faithful? Most of the time, when I follow through with what God has asked me to say there will be at least one person that comes to me afterword and says, “Thank you so much, I needed to hear just that, I’m not sure how you knew to speak to my exact situation…” and it wasn’t me, it was God. What may that be for you? And the list could go on and on. Today make an attempt to skip the arguing and jump right to the obedience. I promise it will be worth it.